With our rear-end finished we're halfway to a solid set of wheels. A couple of things need attention at the front of any old bike: the tire, steering bearings, forks, and brakes. At the bare minimum change the fork oil, go through the brakes and inspect everything else. This is also a good opportunity to do any mods to the turn signals, headlight, gauges, cables, etc. The geometry of the parts that make up the front end is fairly simple and clearly laid out. The wheel mounts to the forks by way of 2 aluminum keepers at the bottom of each fork tube. The fender unbolts with 8 hex bolts (including the brake caliper bracket mounting bolts +1). The forks attach to the triple-trees with four bolts; two on each tree. The steering stem is held in the frame by a large cap nut, pinch bolt on the triple tree, and a threaded steering head top-nut that uses a shock-absorber preload tool. The brake lines, junction block, and master cylinder are just a series of 14mm banjo bolts. Taking all that stuff off is the easy part. Your steering bearings may still be okay, just make sure they're not clicking in the center, binding, loose, etc. We like to change them out since they're too-often poorly lubricated and full of gunk. If you're taking everything apart far enough to grease the loose ball bearings you might as well do the tapered roller bearing upgrade. There are few things I dislike more than reinstalling loose, cage-less ball bearings - flashbacks to the headset on my 70's Fuji road bike. It's easy to underestimate the forks, but if they haven't been serviced in decades they can make the ride a real clunker. You might not notice just how bad they are until you've done the work to rebuild them, then you'll wonder how you went so long beforehand. However, if you're serious about maintaining your machine, it's worth rebuilding the forks altogether. The fork seals are the only parts you need. The EZ-Install ones require the inner surfaces of your lower fork tubes to be in very good shape. The standard factory-style fork seals are more forgiving if your forks have a bit more wear, although they're tougher to install. Just pop the cap off your master cylinder. One quick look in there and you'll get a pretty good idea of what kind of shape your disk brake system is in. If yours looked gunked up like ours, you'll want to clean it out as best you can. The two main front brake components are - the master cylinder (hand-lever that pushes fluid) and the caliper (pinches the disk) - which should both be cleaned and rebuilt. This is also the time to replace your cracked rubber brake lines. Simply swapping out some fresh rubber lines is just fine; that's what we did. If you want to invest in a higher level of performance and reliability there are braided stainless brake lines available. The pressure switch at your junction block should be tested too. If it's bad, replace it. If you're following along on your own bike, you sure are in luck - we've got blogs and videos for this stuff too. Three for three! With the new tire mounted, the front wheel is more-or-less ready to go back on the bike. However, if you pulled the axle from the center of the wheel there are a few extra things you can check on first. Try to get a sense of the condition of your wheel bearings. Like the rear, if they're crunchy, loose, or hanging up anywhere it's best to replace them. If they're smooth and consistent you're probably fine. I left ours alone. If you pulled the axle, chances are your speedo drive fell off. Go ahead and pack some grease in there, but also be very careful putting it back on the wheel. There are two tabs in the speedo drive 180 degrees apart that line up with two recesses in the hub. Those need to be lined up just right when the drive is reinstalled, otherwise when the axle is tightened down the drive will bind against the hub causing all sorts of problems if you try to ride. Just make sure the drive is on the hub all the way, and that when you tighten the axle the wheel still turns freely. Of course, use a fresh speedo cable and tach cable while you're at it. If you're like me you've been putting this stuff back together as you go along. If not, the order is (roughly) steering bearings/stem, fork legs, fender/caliper, wheel, brake lines & master cylinder. You don't necessarily have to go in that order, but logic dictates most of it. There are a few critical nuts and bolts that really should be torqued to spec. If you aren't familiar with the factory-recommended torque values for your machine, get familiar. They're all available for download on our Manuals page. Oh yeah, and buy a torque wrench if don't have one. For the front end specifically, the 4 nuts that hold the keepers around the axle, the two bolts that hold the fork tubes to the lower triple tree, and the three pinch bolts that hold the fork tubes and steering stem to the upper triple-tree. With everything back together and tightened down, the last step is to bleed the brakes. We like to start with the upper section of the brake system together before bleeding the lines with the lower end wrapped up into the reservoir to keep an eye on the air bubbles. Once the lines are purged of air, hook up the lower fitting and bleed the caliper via the bleeder screw. With that, and our last few articles, we've touched on almost all of the important details that will make this 44 year-old Honda CB450 reliable and safe enough for a cross-country ride. There are just a few more things to finish up before this machine is ready to roll. 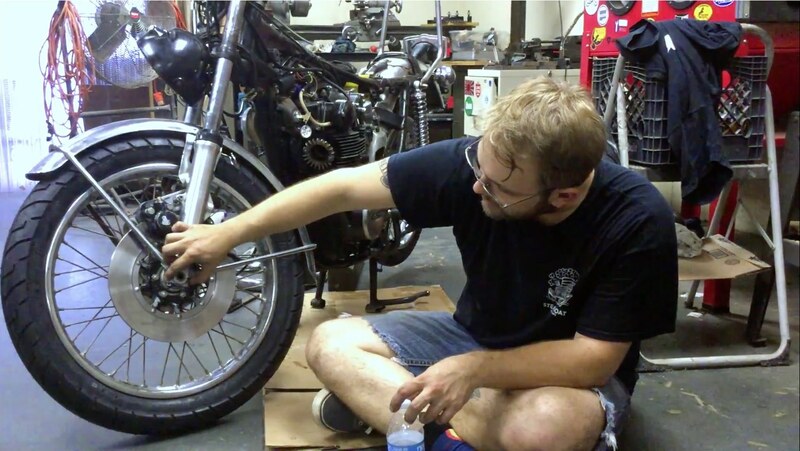 Stay tuned for our last tune-up-related installment of our Long Haul CB450 Project: The Finishing Touches.